The national park offers a limited capacity for viewing and, to protect the park and its wildlife and still allow humans to witness this spellbinding event, the park holds a free lottery in April for the lucky winners to receive parking passes to the viewing area. This year winners will be charged $25 to cover some of the park costs to manage the event in a time of reduced national park funding. This is still an incredible bargain, given the unforgettable nature of the event, and how few people can actually get to witness it. However, there is a way to guarantee a seat at the table. It costs money, but it also serves as a fundraiser to benefit a great cause. 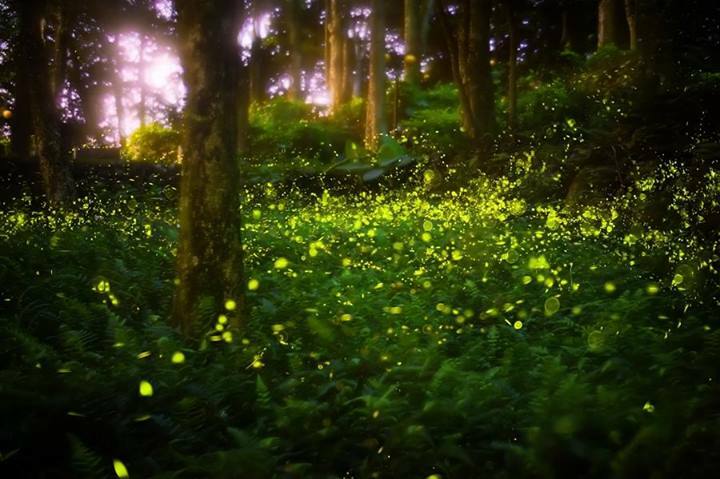 The non-profit organization, Discover Life in America (DLiA), holds its own annual viewing of the synchronous fireflies on a private preserve adjacent to the national park. DLiA performs great work with scientific efforts within the national park but is NOT affiliated with GSMNP. Discover Life in America is based in Great Smoky Mountains National Park, with a goal to learn all it can about the estimated 60,000-80,000 species of life in the national park, and to share that information with scientists and the public. The fundraiser will benefit its ongoing work. Tickets for the firefly viewing are $150 each, which sounds pricey, but consider that this guarantees you a ticket in a small and very limited group, at a private lodge, with expert scientific information, excellent food and drink, and a very comfortable venue to view the synchronous fireflies. If you’re feeling generous and would like related memorabilia from the event, DLiA also features a silent auction of artwork and photography treasures. The food by the way is prepared by our favorite market, Whole Earth Grocery. Tickets for viewing the fireflies will go fast at either venue, so here’s what you need to know. Great Smoky Mountains National Park will open its lottery for tickets to the Elkmont viewing area on Friday, April 26 at 8 am, and will close the lottery on Monday, April 29 at 8 pm. Lucky winners will be notified on May 10, 2019. The park has not yet picked the dates to hold the viewing. Bookmark the park’s Fireflies page for the announcement. Discover Life in America HAS picked its dates for the Norton Creek viewing: three evenings, Friday-Sunday, June 7-9, 2019. Tickets are available NOW for any of the evenings. For information and to buy tickets, check the Fireflies Event at Norton Creek page, and also Facebook. For a view of the Norton Creek event, check the video clip below from DLiA. And for a taste of the Fireflies event in the national park check our own Synchronous Fireflies feature story, with a great video clip from ABC News, which managed to capture some good footage of this occurrence – supremely rare, and also notoriously difficult to film.